Sometimes, when I have a lot going on and things start to slip, I'll remark offhandedly, "Oh, I must be losing it." This week, that statement took on a whoooooole new meaning my friends. It was time for our monthly game of CLUE, the theme was pears, apples, and pumpkins and I was assigned Lauren's blog Sew You Think You Can Cook. So far so good. I hopped on over to Lauren's blog and learned that she left her job as an aerospace engineer to stay at home with her adorable son and hopes to become a caterer. Judging by her delicious recipes, she's well on her way. I quickly settled on her fantastic looking Pear Coffee Cake because um hello, cake! And um hello again, streusel! Then, I made the five minute journey to my neighborhood grocery store, grabbed my goods, rolled on home, and commenced caking. I took the "pears" out of the bag, washed 'em, and got set to peeling when I realized I wasn't holding a pear. I was staring at a peach and it was staring right back at me. For a brief and hopeful second, I thought maybe I'd gotten peaches and pears so I reached in to the bag hoping it was like some sort of genie bag that magically created things that I knew darn well were not there. I obviously came up empty handed. I am not sure how in the span of five minutes, my brain took pears and turned them in to peaches except to say, they both start with the letter p so maybe that's worth an A for effort? I refused to go back to the grocery store on sheer principle so I set to finding myself a peach cake recipe. There were some fantastic looking peach upside down cakes but I had this horrible vision of half the cake getting stuck in the pan which may or may not explain all of the gorgeous pictures on the interwebs showing just half the cake. No, I needed something more "rustic" that could stand up to the many, many cups of coffee I planned on to accompany said cake. I happened on a peach bread recipe, and although my dessert bread experience has been limited to banana and pumpkin, I figured that on a day I had mistaken peaches for pears, I had very little left to lose. So I diced up some peaches, mixed 'em in a decidedly cake'y batter, topped the bread with some of Lauren's delicious streusel and created this here Peach Streusel Bread. The final product was moist, perfectly cake-like, and topped with a deliciously crumbly streusel. Overall, it was a fantastic accompaniment to afternoon coffee time. And at the risk of turning this mishap in to a win, I'm going to go out on a limb and say this streusel bread would be pretty darn with great with actual pears too! What a cute story, Azmina! I think I'm losing it most every day :) I was wondering where the peaches came from for this month's theme, but now it's totally logical. 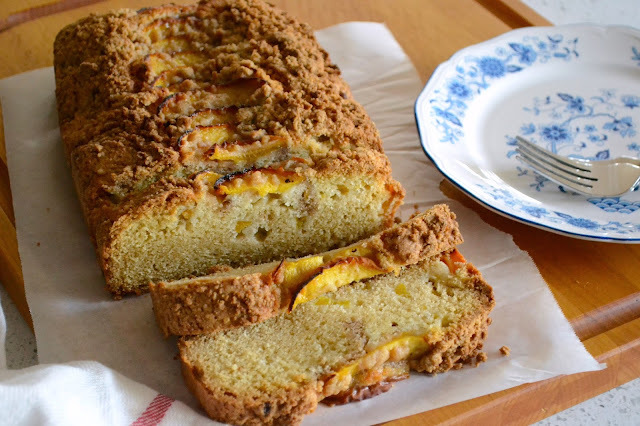 If I could find decent peaches right now, I'd definitely whip up this marvelous bread!!! The bread sounds delicious! I have the happiest accidents when I refuse to go back to the store and just use what I have on hand. So sorry your magic bag transformed your pears to peaches, but I have no doubt your bread was a success. I've thought about making my coffee cake with peaches because my husband's family loves them, but I'm not sure if they'd just fall apart. It is still peach season here Azmina, so I could have made your Peach Crumble and sent a piece laced with arsenic to your nemesis...who wears heels in the grocery store anyway??? I think you must be fated not to have any pear or apple recipes on your blog but I was extremely pleased with the pumpkin cheesecake pie and I have your pumpkin french toast on my to make list. Thanks for the giggles. This looks amazing! I wish I had a piece right now! What a stunning bread! The peaches at the farmers market are still quite tasty here in the Bay Area. Nice choice! Wauw that bread looks nice to me! P is for peaches!! Delicious bread! We all have our moments. I live close enough that sometimes it is too easy to run back to the store. I often think I should make myself WALK to the store to ramp my brain back into gear. You did a mighty fine job with the peaches though!